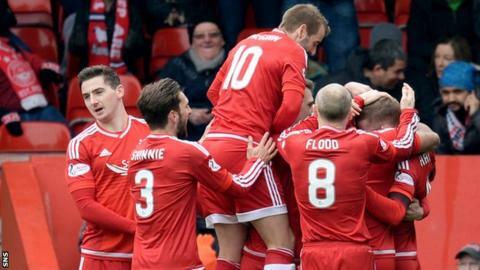 Mark Reynolds believes Aberdeen can win all of their remaining league matches if they replicate the form shown in Sunday's 3-0 win over Hamilton. The Dons trail leaders Celtic by five points with six Premiership games to come. "I think that was us at our best," said Reynolds of Sunday's performance. "When we've got boys on form and boys running at that pace I don't think there's any team in the country that can live with us." Aberdeen were runners-up last season, finishing a distant 17 points behind Celtic. But, with two home wins against the champions this season, Derek McInnes' side have been able to mount a more sustained challenge this time. And the top two will meet once more after the Premiership split. Aberdeen travel to Tynecastle on Friday to face third-placed Hearts, who still have designs on second place. McInnes' side have won both league meetings between the pair this season but were defeated in the most recent Scottish Cup tie in January. "Hearts are going well and having a great season themselves," said Reynolds, who has bounced back from suffering a broken nose earlier in the season. "They're sitting in third and looking to close the gap as well. "They're similar to us, they're in a position where every game has been massive for them. The two of us are going into it looking for three points and I'm sure it'll be a great game." Last month's 2-1 defeat to Motherwell hurt Aberdeen's league chances but Reynolds says the team have not yet given up on ending the Old Firm's 31-year stranglehold on the Scottish title. "All season all we've looked at is just winning the game put in front of us and just getting three points," said the 28-year-old. "From the performances we've put in and the run of games we've been on every three points has been massive. Every game for us has been huge and come Friday it's Hearts and it's another massive three points. "All we can concentrate on is winning every game. We still need Celtic to slip up. We only play them once so we still need another couple of teams to take points off them. "Can it be done? Probably. Will it be done? Who knows? All I can say is we'll go out and try to win every game and make it as hard as possible."